If you are looking for a home or room to rent for a short vacation in the Five Cities area, the map included in the Arroyo Grande City Council’s Aug. 9 regular meeting packet is a good place to start. The map shows a satellite view of the city punctuated by 14 blue and red dots. Each dot marks the site of a home being used as a vacation rental, where owners allow visitors to rent the whole home; or as a or homestay rental, where individuals can rent out a single room using online services like Airbnb. 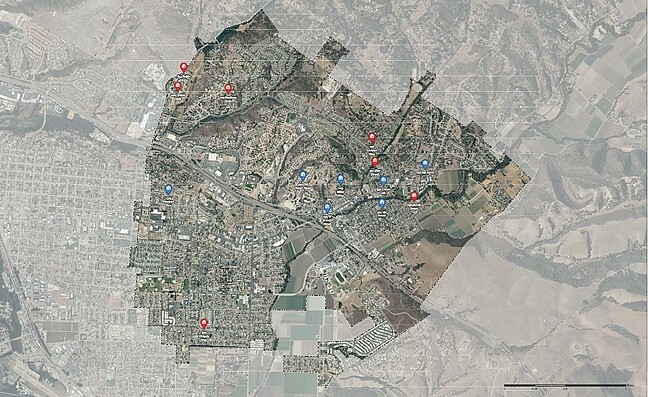 BREAKIN' THE LAW: These 14 vacation rental homes are in compliance with Arroyo Grande’s vacation and homestay rental ordinance. At least 40 more are operating illegally, according to city staff. The city considers these rentals businesses, and the 14 on the map are the homes that actually comply with the city’s vacation and homestay rental ordinance. Even though the law was passed more than two years ago, the city is having difficulty locating scofflaws operating vacation and homestay rentals without a permit. According to a recent city staff report, there are at least 40 illegal rentals in the city. “How is that fair to the 14 residents that have filed their permits and are running their businesses legally within the city?” Patty Welsh, an Arroyo Grande resident, asked at the council’s Aug. 9 meeting. The owners of those rentals are the only ones in compliance with the ordinance, and they are also the only ones generating revenue for the city. Under the current ordinance, would-be vacation and homestay rental owners have to apply for a minor use permit with the city. In addition to paying the fees associated with obtaining that permit, they are also subject to paying a transient occupancy tax (TOT). The tax is levied against hotels, motels, vacation rentals, and homestay rentals that house visitors for any term of less than 30 days. According to the city’s website, the tax is paid on a monthly basis, and the TOT rate is 10 percent. At the meeting, Councilmember Barbara Harmon said that the 14 permitted vacation rental and homestays generated $20,000 in revenue. Harmon expressed a desire to be fair to those who’d “stepped up” and complied with the law. But enforcing the ordinance isn’t easy, according to city staff. Many of the vacation-rental owners may not live in town and can be difficult to contact. The nature of rentals advertised online, such as homestays advertised on Airbnb, also make enforcement of the city’s ordinance difficult, according to the staff. Many of those sites don’t publicly post the addresses of such rentals and limit information about the individuals who own the rentals, leaving much of the footwork involved with identifying them up to the city itself. Downing did say there are some companies that, for a price, will monitor and research just how many are operating within the city. At the meeting, Downing and city staff were unsure of what that would cost. But even if city staff could identify every illegal vacation or homestay rental, they would still need to dedicate personnel, time, and resources to those efforts. Usually, enforcement would fall into the lap of the city’s Neighborhood Services, a hybrid department run by AG’s neighborhood development and police departments. But there are only so many enforcement personnel from that department. In the end, the city is still trying to bring more rentals into compliance and to determine whether individuals who rent out homes or rooms are actively skirting the law or simply aren’t educated about it. “It truly may be a matter, at least for some, of not understanding the city rules,” said Teresa McClish, Arroyo Grande community development director.